To help you make 2016 even better than 2015, indicate a few things on this visual roadmap for next year and give some hints for what could be for 2016. What could be better for you, your clients and customers, your team, your family, your community...? Don’t leave your work, team or project this year without this thought for next year’s focus. Even if you don’t know all the details yet. When you hint at the future now, you'll have a much better result than trying to start fresh in 2016. If you come at this thinking all cold after a break or if you're feeling a little ‘bluh’ after too much turkey, you won’t do your best work - alone or together. Leverage the crazy momentum of now to set some thoughts for next. So go ahead and get some of your initial thoughts, hints and hunches down now. Just a few. what your focus or major project is for each of those quarters; you could write that theme in the white signs on the side of the road. and then add in any other key things to look out for or think about or work on; you could write that on the greenery on the roadside. Some teams have a meeting to work on and chat about my roadmap, others fill it in and then compare notes - whatever works for you, get some initial thoughts down before you wrap up the year. make them part of the picture. Get some of your thinking outta your head now; you will all reap great rewards when 2016 arrives. Indecision is such a business and momentum killer. Think of a meeting or conversation; there are ideas, possibilities, but then it all screeches to a halt because there isn’t a decision. Or wait, here’s the decision: lets set another meeting date and talk about it all again next time. Urgh! I think we are losing the drive to decide. Yet decisions are such a vital component of leadership. They help you choose a course of action. They set a direction. They help express your leadership. They give people some certainty in this crazy uncertain world. How about this: earlier this week I heard of more than 30 team members being on the receiving end and consequences of the indecision of a senior manager in a large organisation … the leader couldn’t decide what to do with the most important part of their strategy day, which is just a few days away. What? It’s a big and important strategy day. And it’s that big and important and you can’t decide!? You still have no certainty on what you want to achieve, how you will do that, and you’re still oscillating and circulating and debating and ruminating over what could possibly be done. And it’s a strategy day. And it’s important. And it’s involving other people. And it’s about the future of the team and what you work on. Whatever the details and the whys and wherefores and ‘yeah but maybe theys’ that you may be scripting in your mind about this situation, the point here is that a decision wasn’t made. Over a period of time. No decision. There’s a lack of leadership right there. That’s what it looks like. It's Indecision. It's Oscillation. And Hesitation. Contemporary leaders must give some their teams certainty over the stuff they CAN give certainty on. And making decisions is one of them. Decisions help give people certainty. Leadership is about making heaps of decisions. Every day. Deciding which things will you tell, which you’ll share, ask or do; which things will you instigate, delegate, escalate, mitigate. Yet it’s that flipping from one view to another, unable to make a call or to put a marker in the sand… it's that 'dicking around’ I call it, the not deciding that is a momentum and engagement killer. maybe this will cause conflict … and a bunch of other hesitation hang ups. Along with authenticity, clear communication and setting visions, leaders dear leaders, you need to make a FREAKING DECISION. And make it fast. Make one now. If it doesn’t work, that is also known as ‘failing fast’. And you will soon know if it’s not right. Failure and failing fast is very ‘now’; it’s contemporary, hip and the done thing in agile teams and organisations. But you’ve got to decide so you can act and then see what happens. If you don’t decide, then you’re not leading. If you’re not making a decision you’re not stepping into action, you’re not running an experiment and you’re not leading. You’re lying… in waiting. It’s like you are balancing on a high wire, not moving towards the end goal and neither are you reversing or backing up to go along some other high wire. You don’t even have anything to help you balance on that wire. You’re a balance-less high wire walker. And that’s dangerous. You’re putting yourself in a situation where a little gust of wind, a little rattle on the high wire is something that could topple you over. That wouldn’t be a good ending. "To decide". It means to end and terminate the choices you have. It means to ‘cut off’. Don’t be the person or role that someone else decides to cut off because you’re not making decisions in your team or organisation. Decisions are leadership.Do them. Make them. Lead. What does the view look like from where you are right now? Jim Haudan in 'The Art of Engagement: Bridging the Gap between People and Possibilities' explains how people across an organisation 'fly' at different levels. He suggests 1000ft, 15000ft and 35000ft. Cruising Altitude: way up there, at 35,000 feet you're getting the big picture and a broad perspective stretching way over the horizon. Just above here is a visual I use with teams to get them thinking about these different levels. You can write your thoughts in the clouds! Relax and enjoy the flight; these levels are normal, natural and a part of everyday. But sheeesh it's hard when you're trying to bring people together to align to a strategy, implement a change or adopt some new ways of doing things! We're so biased to see things that reinforce our beliefs that we need to take some deliberate action to see things in another way... in a way that other people may not see. "our insights stem from the force for noticing connections, coincidences, and curiosities"
How does the view change if you climb up, up up? What's different if you zoom down and get a closer view? How do things look from where you are if you're 'on the ground'? 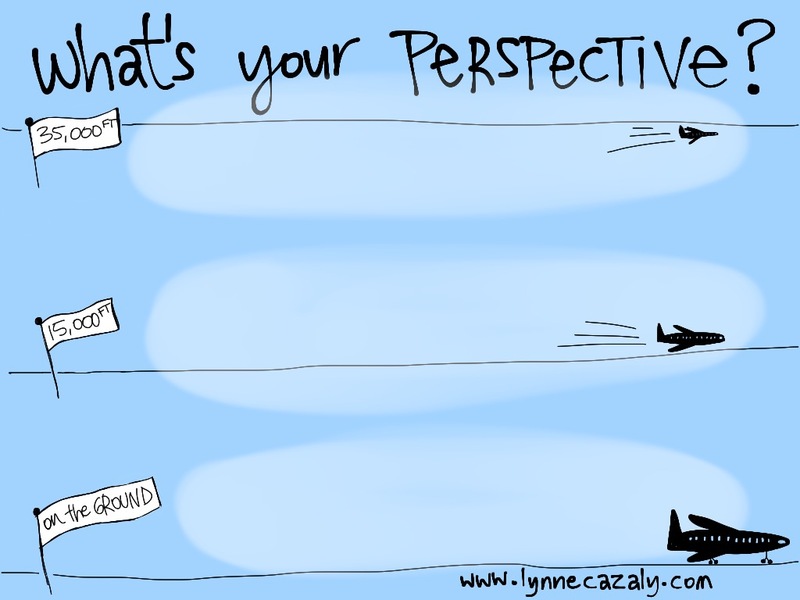 What perspective, view or angle are you missing out on from where you are now? What do you need to do so you have a broader (or narrower) view? What might you have missed? "people who can pick up on trends, spot patterns, wonder about irregularities, and notice coincidences are an important resource." Seeing things, connecting the dots and making sense: this is the true competitive advantage of being able to see what others don't ...and I reckon that's a must-have skill for the uncertain future of work.